Sometimes late at night, I doubt why I spend my time writing articles for Openwide when I could be handing in essays on time. There are times when I think my efforts are futile, but every time I hear people praise the publication or talk about an article they’ve read, I melt into a puddle of delight. If so many people are praising the publication, why aren’t more people writing for it? This part does not really bother me as much because everyone has different priorities. It’s not easy to research, write, and edit an extra 700 words on top of everything else being demanded of you. Maybe, just a small maybe, after this article some of you will see that it is worth your time. For me, the thought of Openwide not continuing is unbearable. A world without the existence of this kind of publication is a world not worth existing. But that’s just me. These days the world seems to be so much of that – this “just me.” In FIMS classes, we are inundated with examples of how our world is becoming an individualist, capitalist, nihilist, consumerist hot mess. The boys of the Frankfurt School would scoff at some of the content that manages to grab our attention these days as pacifying nonsense with the sole purpose of keeping us complacent. We as media studies students know better than most the effects of mass media and the numbing of critical thinking that it promotes, but we also know that it is not completely true. The balance may be off, but critical content still exists. Look at the popularity of John Oliver’s 20 minute displays of investigative journalism masked as comedy, or the anti-consumerist magazine Adbusters. There are people out there who choose to think, to question, to contemplate. 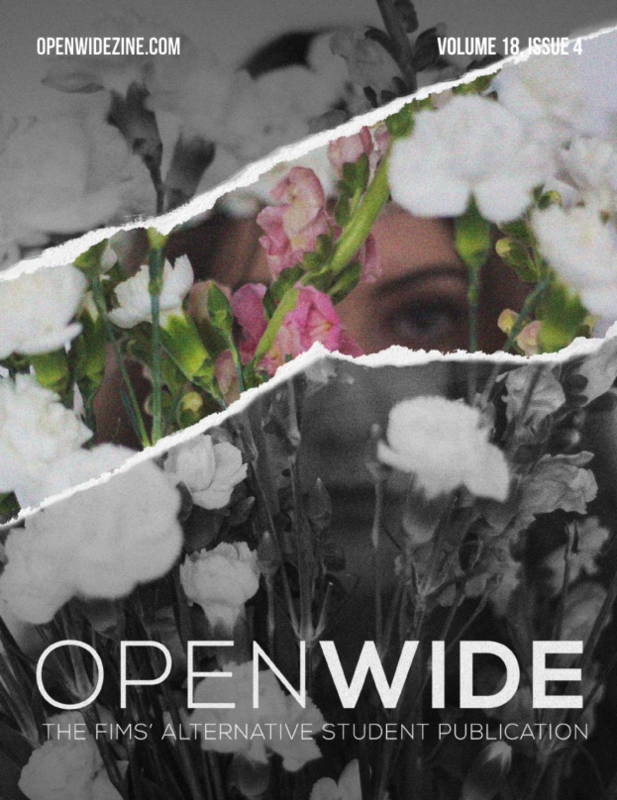 As readers of Openwide, you are among them. We know our articles aren’t as easy to digest as Buzzfeed articles, but you still choose to read them. If the measure of a civilization is its compassion, then this publication is full of it. Openwide does not publish that often, but when it does, its articles are full of compassion. By that I mean, our articles dig a little deeper. We engage in our content critically to produce articles that leave an impression in a culture of speed. Time, care, compassion, every article is a labour of love. But Openwide isn’t afraid to dish out some tough love from time to time. It produces articles that force students to reflect and critique their institution, promoting advocacy through information. It’s so much more than a magazine, it is part of a mentality that opposes the norm. When everyone else is telling you to get a move on and go, we’re saying stop. Read. Revel in the detail. Reflect. At the end of the day, some people won’t care, some people will never care, but this article isn’t for them. This publication is for you. You, the one who thinks long after lecture is over. You, the one who doesn’t think paying attention to detail is an expense. You, the self-proclaimed lifelong learner. You, the one who picks research topics based on interest instead of ease. You, the one who hasn’t stopped reading after the introduction.